Debating Human Genetics is based on ethnographic research focusing primarily on the UK publics who are debating and engaging with human genetics, and related bio and techno-science. Drawing on recent interviews and data, collated in a range of public settings, it provides a unique overview of multiple publics as they ‘frame’ the stake of the debates in this emerging, complex and controversial arena. The book outlines key sites and applications of human genetics that have sparked public interest, such as biobanks, stem cells, genetic screening and genomics. It also addresses the ‘scientific contoversies’ that have made considerable impact in the public sphere – the UK police DNA database, gene patenting, ‘saviour siblings’, and human cloning. 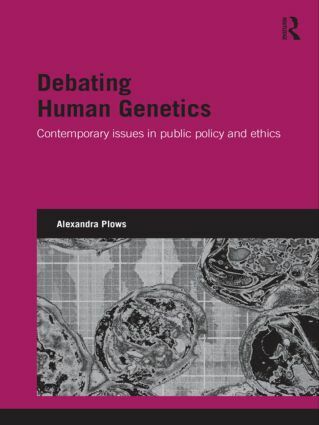 By grounding the concepts and issues of human genetics in the real life narratives and actions of patient groups, genetic watchdogs, scientists, policy makers, and many other public groups, the book exemplifies how human genetics is a site where public knowledge and value claims converge and collide, and identifies the emergence of ‘hybrid publics’ who are engaging with this hybrid science.